On a day just like this one (dark and rainy) 58 years ago I was standing outside the window of a travel agency on Broadway in downtown Portland. There was a beautiful poster of Hawaii and the Lurline. You know the rest. Have a wonderful life! 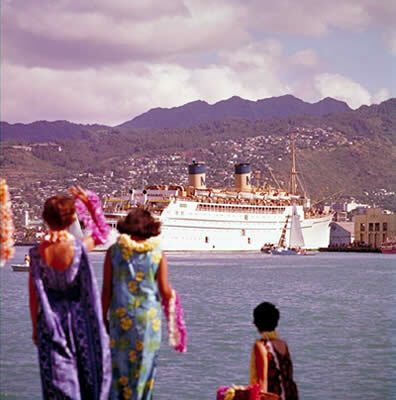 My mom took the SS Lurline from San Francisco to Honolulu in 1952. She was a sheltered 20 year old just out of the University of Oregon. On board, she met a gal named Diane from the Midwest, and they ended up rooming together. My mom got a job at Liberty House, the department store in Waikiki. She saw the Andrews Sisters there once. Diane, being somewhat less sheltered than my mom, brought home a couple of sailors one evening so they could all go out on a date. One of them was my dad. You know, to-be. They got married on the mainland, and my sister Lynne came along pretty soon after that, and Hawaii was a long, long ways away in those days, so we were raised on stories of the Royal Hawaiian Hotel and the Lurline and a Hawaii that was, to my parents, inherently romantic. 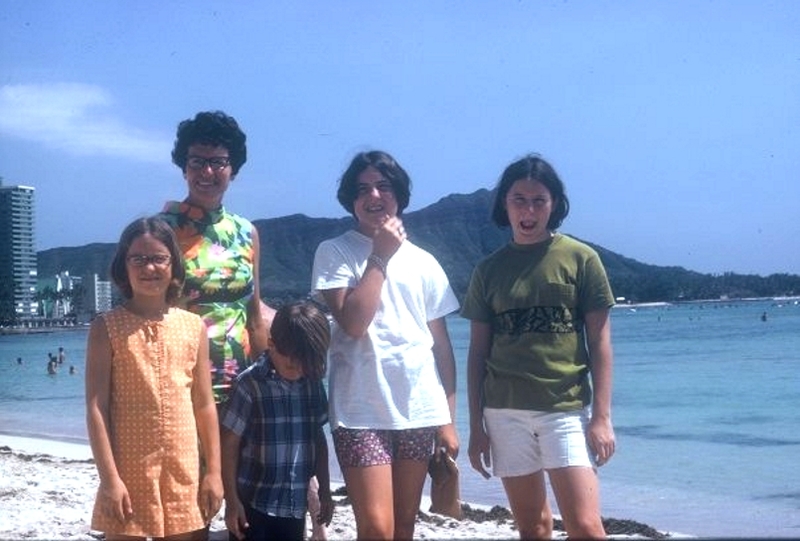 Fifteen years later, my dad got a job at the Bishop Museum in Honolulu, and one September day in 1967, my mom, my dad, and their four kids aged 7, 9, 11 (that was me) and 13, got on an airplane and moved back to Hawaii. We stayed with Diane and her four kids in Kailua for the first few weeks. To my eleven-year-old mind, there was a vast gulf of time between the Waikiki of family legend and the Waikiki I hung around in, but I can look back now and see how fast those fifteen years must have passed, and how young my parents still were when they finally found a way to go back to the romantic and beautiful place where they'd met. Circa 1969. I'm the giant 13-year-old with the good legs and the bad haircut. We only lasted six years in Hawaii before my dad became, I think, disenchanted, and we moved to a new paradise (Santa Barbara, California). Six years. Big deal. I've got a pair of jeans older than that. But those six years? I was eleven when we arrived and eighteen when we left. They were bigger than ordinary years. I still can't drive in snow, and I still hate socks, and I still have only the island sense of direction: mauka, makai, Ewa and Diamon' Head--towards the mountains, towards the ocean, and, um, towards that big volcanic landmark in the photo. And some town on the leeward side. in a pinch I can still speak a little Pidgin English and sing a couple of songs in Hawaiian. I have an abiding distaste for tourism. The Rod Stewart song "Maggie May" is permanently linked in my mind with bodysurfing at Makaha. Geckos don't bother me. Giant cockroaches do. I make no claim to being an Islander. I'm not the tropical type--never was. I wanted seasons, and cities, and wool clothes (and smaller cockroaches), and I went to Europe as soon and as often as I could once I got off the Rock. I've only been back to Hawaii twice, and can't imagine that I'll ever go again. But I wouldn't trade the experience of growing up there for anything. It was a vastly different culture, and in some very real ways a foreign country (it was still in its first decade of statehood when we moved there). I was an outsider, even an ethnic minority, in the town we lived in--an experience not many white girls from Portland had had at that time. I had to assimilate, and I did, and it's a life skill that I'm very glad to have. These days, I live within a short walk of the Portland hospital where I was born. Of my 54 years, I've spent 40 in this town, and yet nothing has shaped me more than the six barefoot December birthdays, the six grades of homework done on the beach, the six sunny Christmases, or the six deafening Chinese-style New Year's Eves that I spent on Windward Oahu. What does this have to do with 2009 or my hopes for 2010? Not a thing, really, except that New Year's Eve seems like as good a time as any for a jaunt in the Wayback Machine. Hau'oli Makahiki Hou, everybody. Happy New Year. Time is so relative, isn't it? Not all years are worth the same amount. That's a good way of putting it. They get to be a pretty thin slice of the whole after a while. What a great remembrance. Thanks for sharing. Thanks! You too! I'm sanguine. Yup. They don't call 'em "formative years" for nothing, I guess. And I didn't know that about you, either. So, you picked up east-coast style and speech patterns and kept 'em? I love this. What a neat thing to learn about you!. And what a great picture! Love it. Thank you so much for sharing. Thank you for reading! Glad you enjoyed it. Style like Sixties Hawaii doesn't come along but once every couple of generations. Thank God. It certainly had its moments!